We spend a lot of time on this blog talking about the characteristics and behaviors of employees that can lead to a workplace safety incident. This week, I want to switch gears and talk about jobs that are inherently dangerous in and of themselves and the individuals who choose to go into these lines of work. Do you think you could do this man’s job? I certainly couldn’t. I’m not even afraid of heights, but the sheer magnitude of that tower and the intense focus it must take to remain calm while performing a task like that lends itself to only certain personality types (excluding any physical limitations). Although uncommon, these jobs are often critical to organizational functioning so someone has to do them, but what is it about the worker in the video that allows him to be comfortable enough to make this kind of work his career? The worker in the video was wearing his appropriate PPE and using his fall protection gear. 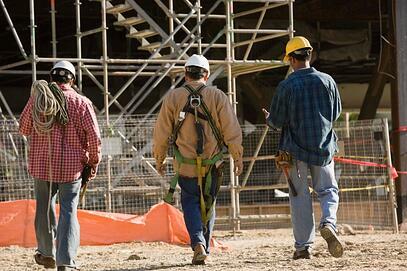 These jobs tend to have the most rigid and thorough safety guidelines, as well as extensive safety training. A distinction should be made between a high-risk job and a high-risk employee. Every job has an inherent level of risk associated with the work, as sometimes safety is not fully in the hands of the employee. However, regardless of how dangerous the job is, employees are responsible for exhibiting safety-conscious behaviors that will minimize risk. The worker in the video may never experience an accident or injury on the job if he always follows safety protocols, while someone working in an office building can easily hurt themselves if they are not paying attention to their surroundings. When we think about common dangerous jobs like construction or law enforcement, various themes arise as to why individuals choose these lines of work despite the injury and fatality rates that they carry. For example, construction often pays the best for workers with a more blue-collar skill set, and people often become police officers because of a family legacy or feeling of civic duty to their communities. But the fact remains that across all industries, some people are more cut out for dangerous jobs than others. Those who hold dangerous jobs usually have a SafetyDNA® safety profile distinct from most others that helps us understand how they tick. These individuals tend to have a need for adrenaline and risk-taking and are often the first to volunteer for tasks that others shy away from because they are highly confident in themselves and their abilities. They also work well under pressure without distraction due to their keen sense of awareness for their environment and detail orientation. However, their comfort level with dangerous tasks and propensity to trust themselves over rules can lead to safety blind spots associated with being less cautious and breaking safety protocols on the job, so it is particularly critical for these workers to maintain low-risk safety behaviors. People with dangerous jobs know the risks involved, yet still get up and go to work every day, performing necessary tasks that most of us wouldn’t dream of doing. They may even enjoy the rush that comes with the present dangers, even under strict controls. The characteristics that guide these individuals to their jobs shouldn’t be stifled, rather they should be encouraged, as long as safety remains a top priority.